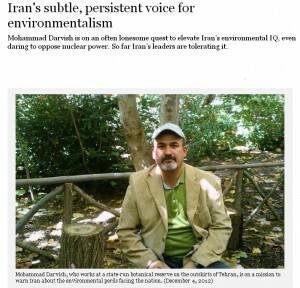 Mohammad Darvish, born on January 24th, 1966, has been the loudest and the most persistent voice for the environment in Iran. 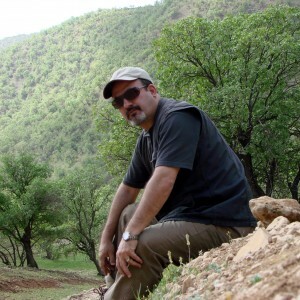 For more than the scope of thirty years, he has managed to produce more content is his blog, Combating Desertification, than any other environmentalist on the cyberspace, depicting the ups and downs of the Iran’s environment. He has managed to open an illuminating window into the devastating reality of our country’s greatest assets and at the same time, tirelessly taking practical measures to invoke hope into many of us disillusioned and despaired of rescue. He is a man of many titles and during his professional life, he has been appointed to important posts in the realm of environment; however, it is not how or why we dearly keep him in our hearts. He is a man of true integrity; he speaks his heart regardless of the consequences; he is humble; he is modest; he lived in a rental basement when working as a director for the “Environment Protection Organization”; he is friendly and amiable and, more than anything else, he has not forgotten who he is, where he came from and what he fights for. Mohammad Darvish is a representative of a rarity we have of always felt the lack of in our country. His 53rd birthday is around the corner. I am happy his efforts are not unheard of and there are women and men who appreciate his precious life, which he spent for the inhabitants of our home country. May he have a splendid night in the midst of his friends and fans. “We need to have a strategy. There is no strategy. 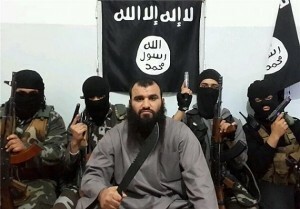 And anybody that says that there is, I would like to hear what it is, because it certainly isn`t apparent now, and right now we are seeing these horrible — reports are now in Palmyra they`re executing people and leaving their bodies in the streets. Meanwhile, the president of the United States is saying that the biggest enemy we have is climate change.” Said McCain in the interview. Another thing which is not new is the demagogic repositioning of GOP against the Democrat President as we go closer to the new Presidential election and McCain has proven to be no exception. Not only has his remark on the issue of environment come as a shock to environmentalists and people who are concerned around the world, but it also indicates how GOP war lords take advantage of the misinformation of the public no matter the price. It is worth noting that on the same day as Sen. McCain’s response to Bob Schieffer, when ISIS, one of the consequences of President Bush’s war against terror, slathered tens of innocent residents of Palmira, we heard from some southern provinces of India that the number of the casualties of the unprecedented heat wave has crossed the boundary of 430; In the US, flood displaced many of the residents of the southern states and damaged the infrastructures at the cost of billions of dollars. If we have a look at the press, we will see hundreds of similar disasters such as drought, haze and air-pollution taking place on our wounded planet every day. It is not my intention, however, to pin point the destructing effects of the climate change phenomenon as it is, I believe, crystal clear who or what can be considered as our and our planet’s most threatening enemy. We only need to recall hurricane Sandy which cost the economy of the States 10 billion dollars daily or that Japan cannot yet recover from what Fukushima nuclear reactors did to its economy. It was an unmeasurably horrific incident which is still threatening the mental and physical well-being of the citizens of the country. Inside Iran, McCain’s response will become more tangibly painful when we come across the authorities using the McCain “weapon”, criticizing and humiliating the concerns and accomplishments of environmental activists and environment lovers. It was not long ago when one of the MPs, with a humiliating tone, accused Ebtekar of being more concerned with “cats” rather than the residents of Khoozestan. There, in another event, were officials who responded to the concern of some responsible and humane residents of Fars regarding the unbelievably cruel ways the dogs are treated in Shiraz with disrespectful and grotesque words. In many similar cases, we have observed the authorities, MPs and the political and economic elite’s unconcerned or sometimes aggressive and violent reactions to some precious resistance of a minority who have understood the dire consequences of being indifferent towards the destruction of the eco-system. Take Ashoradeh as an example, a group of influential investors are planning to build resorts on the island while certain apathetic MPs are stating that there is nothing on this island except for some pomegranate trees and jackals and therefore, it is not worth the ink to write with. “……the current imbalance of 0.6 watts/square meter (which does not include the energy already used to cause the current warming of 0.8°C) was equivalent to exploding 400,000 Hiroshima atomic bombs every day, 365 days per year. Therefore, if Mr. McCain and his comrades are truly compassionate toward the poor and disadvantaged people of Iraq, Syria, Yemen, Afghanistan, Pakistan, Libya, Sudan, etc. stating that they are victims of a lack of strategy, they should do their utmost to crack down on the cruel, doom and evil phenomena of climate change, deforestation, desertification and water and land subsidence in Mesopotamia, Africa and the west of the subcontinent of India. They should drum on bio-democracy in which all residents of the planet are given an equal chance of living, shouldn’t they? Oman sultan’s visit reportedly a mediation bid between Iran and U.S.
September 10, 2013, 11:37 a.m.
TEHRAN — She was known to Western media as “Mary” when she appeared before the world’s cameras to speak for the Iranian Islamic revolutionaries who seized 52 Americans at the U.S. Embassy in Tehran in 1979. Masoumeh Ebtekar served as spokeswoman for the hostage-takers during the 444-day standoff, chosen for the English fluency she acquired growing up in the United States. But she was also a believer 30-some years ago, she has conceded in recent interviews, in the cause of punishing Washington for its role in a 1953 coup that brought to power the hated shah, Mohammad Reza Pahlavi. Ebtekar, now 52 and mellowed, like many faces from that fevered heyday of the revolution, was named by Iranian President Hassan Rouhani on Tuesday to serve as a vice president and head of environmental affairs. Ebtekar became the first female vice president of Iran in 1997, when she was appointed to the office by reformist President Mohammad Khatami, with whom she served throughout his eight years as political leader. Her appointment by Rouhani underscored the newly inaugurated president’s efforts to strike a more moderate and collaborative posture toward the West after eight years of intensifying isolation brought on by his combative predecessor, Mahmoud Ahmadinejad. An announcement of Ebtekar’s appointment carried by the official Fars News Agency said she holds a doctorate in immunology and has been an associate professor in an array of scientific and medical disciplines at Tehran’s Tarbiat Modares University. 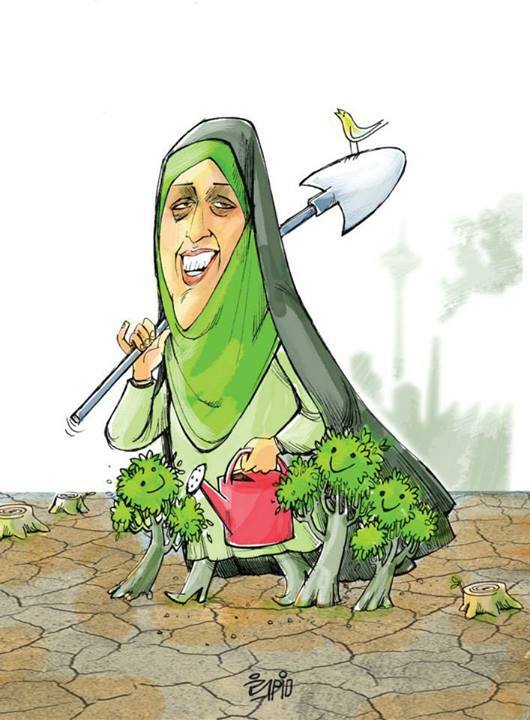 As a member of the Tehran City Council for the last six years, she led efforts to tackle air-pollution problems in the capital and to protect marine life in the Persian Gulf, the English-language Tehran Times added. Ebtekar served on the city council under conservative Mayor Mohammed Baqer Qalibaf, with whom she clashed frequently, according to Iranian media reports. Kayhan Persian, a mouthpiece of the hardliners who are gradually being pushed to the sidelines as Rouhani assembles his team, prepared a critical commentary on Ebtekar’s reemergence in the leadership for its Wednesday editions. Mohammad Darvish, an environmentalist and columnist for reform-backing publications, said Ebtekar was proposed for the post following an online vote among more than 1,000 ecologists and environmentalists asked who would best serve as the nation’s top environmental advocate. “It is a good sign to show that President Rouhani is keeping his campaign promise to respect the opinion of experts and professional associations and unions,” said Darvish, praising Ebtekar as well connected and experienced. Ebtekar is the second woman Rouhani has appointed to a senior administration post, following the selection of Elham Aminzadeh as vice president for legal affairs last month. The appointments suggest Rouhani is seeking to bolster his campaign trail promises to improve relations with the outside world. The president last week announced that he was taking control of suspended negotiations over Iran’s nuclear programs from the religious hierarchy and putting his reformist foreign minister in charge. On Monday, Rouhani urged his new Cabinet members to open personal pages on Facebook to be more accessible to the populace — an about-face from the Tehran regime’s previous efforts to limit Iranians’ access to social media. Special correspondent Mostaghim reported from Tehran and Times staff writer Williams from Los Angeles. TEHRAN, Iran — As temperatures soared above 105 degrees Fahrenheit during one of the hottest summers here in recent memory, no snow was visible atop the mountains ringing Tehran and no water flowed down the narrow channels along main streets (known as jubes in Farsi) that a year ago were still full of fresh mountain runoff. A furry brown haze obscured the skyline, irritating eyes and tickling throats. Global warming and a deteriorating environment are a large if not larger threat than sanctions to the well-being of Iran’s 75 million people. While most press attention has focused on the inauguration of a new Iranian president, the nuclear crisis and the impact of Western economic sanctions, global warming and a deteriorating environment loom as large if not larger as a threat to the well-being of Iran’s 75 million people. Water resources are dwindling as Iran’s three major lakes dry up, the majority of the country’s other lakes are also in the process of disappearing and becoming contaminated with wastes and chemicals, neighboring countries build dams that divert shared rivers away from Iran and underground aquifers are depleted. Lake Orumieh in northwestern Iran has been “despoiled to the point of destruction,” wrote Eskander Firouz, a legendary Iranian environmentalist, in his 2005 book The Complete Fauna of Iran. Lake Hamoun in the southeast, “once the greatest expanse of fresh water in Iran, is now totally dry,” according to Firouz, while a third once-giant lake — Bakhtegan near the southern city of Shiraz, the third-largest lake in Iran, dried up completely almost a decade ago. Lewis told Al-Monitor that expanding agriculture to feed Iran’s growing population has led to “unsustainable harvesting of aquifers.” There are currently about 650,000 wells in Iran that provide more than half the water consumed in the country, he said. Despite the looming shortages, Iranians do not use water efficiently. Domestic use of water resources in Iran is about 70% more than the global average, said Lewis. In Tehran, shopkeepers can be seen hosing off the sidewalks in front of their stores instead of sweeping up the dirt; during last week’s heat wave, municipal workers also liberally watered public gardens with hoses rather than using more scientific means of irrigation. Lewis said official statistics show that there is only 30% water-use efficiency in agriculture, a sector which accounts for over 90% of water use in Iran. Deforestation and desertification are also major problems contributing to land degradation, he said. While there are dozens of national parks, wildlife refuges and protected areas in Iran, biodiversity is decreasing and more needs to be done to bolster guards assigned to prevent poaching, experts say. Firouz told Al-Monitor that Iran’s wildlife has declined by 85%, that rangelands are being degraded and destroyed and that the best of Iran’s forests have disappeared and have often been replaced by orange trees and unsustainable agriculture. Air pollution is another major problem. Since the 1979 revolution, Tehran’s population nearly tripled from about 4.5 million to more than 12 million people, who sometimes all seem to be jamming the roads at the same time. Relatively cheap gasoline — still less than $1 a gallon after subsidy reforms — the poor quality of locally made gas (which Iran must refine because of sanctions that block imports) and the preponderance of cars with substandard emissions controls are major contributors to pollution in the Iranian capital. The lack of a more extensive and reliable public-transportation system is also a major factor. The Tehran municipality has invested more in roads, tunnels and flyovers that benefit private automobile owners than in buses, subways and trams that could relieve congestion and pollution. The pollution has serious health consequences. In the winter, when the air is at its dirtiest because of inversion which traps pollutants under a layer of cold air on windless days, the Tehran municipality often closes offices and schools and those Iranians who do venture out wear face masks. 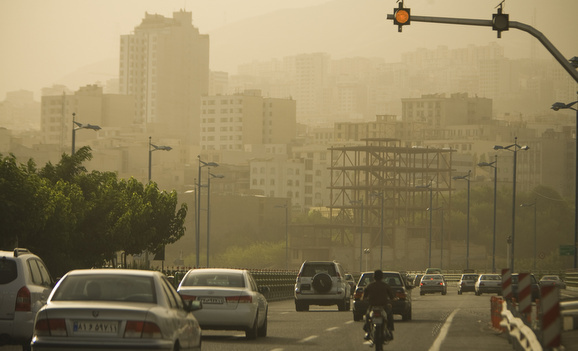 In the height of summer, pollution levels are also high, particularly in south Tehran, which is at a lower elevation than the wealthier north. A pharmacist in the south Tehran neighborhood of Javadieh told Al-Monitor that asthma is a growing problem, particularly among young children and that there is a shortage of inhalers — because of sanctions and government mismanagement — to treat this potentially life-threatening condition. 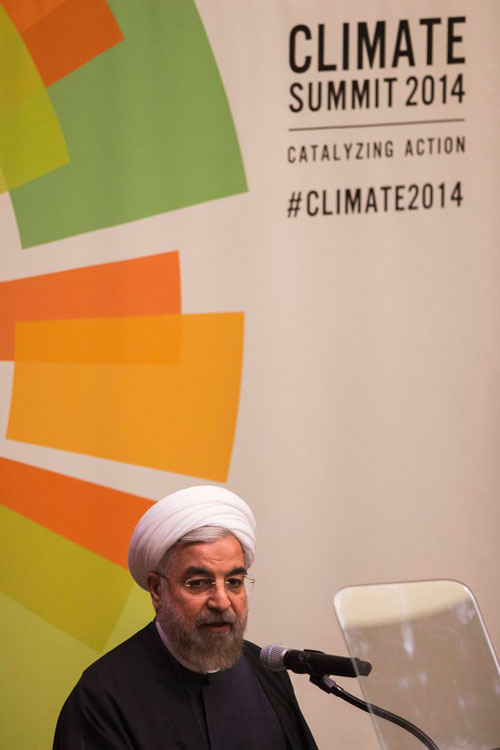 Iran has also been slow to embrace renewable energy, which currently provides less than 1% of energy demand. All is not bleak, however. There is rising environmental consciousness in Iran, particularly among educated youth. A middle-aged ecologist named Mohammad Darvish writes frequently on the subject and has predicted that Iran will someday have a “green” movement that is environmental rather than ideological in nature. Firouz, who headed Iran’s first department of the environment before the 1979 revolution, told Al-Monitor the topic is increasingly covered by the Reformist-moderate Iranian press, including Etemaad and Shargh newspapers, and that more than 1,000 young people have formed a blog on Facebook devoted to his work on biodiversity, conservation and the need for better planning that takes the environment into account. The United Nations is also doing its part, advising Iran on reforestation, carbon sequestration and wetland-recovery programs. Mohammad Darvish’s Combating Desertification is by far the most active environment-oriented Persian blog. His blog is anextension of his other advocacy work regarding the necessity of maintaining the ecosystem in the face of development, including from tourism, dams, and other industrial uses of land, water and air. Mohammad Darvish is on an often lonesome quest to elevate Iran’s environmental IQ, even daring to oppose nuclear power. So far Iran’s leaders are tolerating it. TEHRAN — His son is named after the river born where the Tigris and Euphrates meet. His wife once complained that he loved a rare species of yellow deer more than her. Mohammad Darvish, 47, is Iran’s green gladiator, engaged in a quixotic, often lonesome quest to elevate his homeland’s environmental IQ. In a nation where security and economic concerns overshadow threats to a varied and fragile ecosystem, he even dares to oppose nuclear power, sacrosanct to Iran’s leaders. Darvish, working from a state-run botanical reserve on the western outskirts of this traffic-clogged capital, is a subtle but persistent voice, direct but non-threatening in his message as he warns about desertification, deforestation, pollution, climate change and other perils to this mostly arid land. Unlike the country’s understandably edgy political activists, who face the constant threat of police harassment, Darvish has a carefree demeanor. Each Sunday, he spreads his message in a morning spot on state TV. He also writes a widely read environmental column in a moderate newspaper and a blog focusing on Iran’s ecology. As in the West, much of the public discussion about Iran among its citizens focuses on the sanctions-driven economic crisis and the cataclysmic prospect of war, both related to Tehran’s nuclear development efforts. The West and Israel allege that Iran harbors a hidden agenda to build an atomic bomb. Tehran contends that its research is for purely peaceful purposes: energy generation and the production of isotopes for cancer treatment. Iran’s ever-vigilant information overseers have tolerated Darvish’s anti-nuclear advocacy, perhaps in part because the theme is a relatively discreet one in his work, far from a crusade. His opposition is based on ecological threats, he emphasizes, not strategic ones. “I am not a nuclear scientist, but I believe producing nuclear energy to be used for electricity is too costly and prone to environmental hazards,” Darvish says, sitting on a bench in a wooden cabin on the reserve’s rambling grounds. Darvish avoids polemics. As a public worker — he is one of several managers at the state reserve — his preferred style is to address issues, not attack officials. “Darvish, at the end of the day, is a state employee and civil servant,” says Naser Karami, a climatologist and editor of an environmental news agency who agrees with many of Darvish’s positions. Karami says Iranians are “being told one lie after the other” about environmental threats in a country that doesn’t get high marks for safeguarding its natural heritage. The air was so polluted in Tehran this week that Iranian authorities announced Monday that schools and state-run offices would be closed Tuesday and Wednesday, essentially shutting down much of the capital. Darvish, a native of Tehran who has a master’s degree in environmental management from Tehran University, traces his passion to childhood trips to the zoo and summers spent at his grandfather’s rural home. There he was exposed to livestock, wildlife and a sense of liberation. “I strolled and daydreamed,” he recalls of that youthful idyll. Iranians are not impervious to environmental concerns. The Internet and a growing eco-tourism sector have helped raise awareness. Road construction and pipeline-laying in sensitive areas stir up public emotions, as do emissions-linked urban air pollution and oil contamination. “There is much more awareness” compared with a decade ago, says Darvish. Still, he says, environmental activism remains largely confined to elite circles. It is well off the radar screens of most Iranians, who are focused on paying bills and feeding their families. Preservation is clearly not a priority for Iran’s rulers, desperate for economic development amid crushing Western sanctions linked to the nuclear program. But even amid widespread economic uncertainty, signs of nascent awareness are unmistakable, as are government responses. Last year, authorities arrested dozens who rallied to save shrinking Lake Urmia, one of the world’s largest salt lakes, now ravaged by drought and the damming of feeder rivers in Iran’s northwest. Officials said the protesters were arrested for demonstrating without a permit, but some activists suspected hostility against ethnic Azeris, the predominant population in the area. Besides his stand against nuclear energy, Darvish has also voiced opposition to a mega-project that would transport desalinated Caspian Sea water to the parched northern city of Semnan, a cherished proposal of President Mahmoud Ahmadinejad. Darvish has labeled the project a technical and natural folly. But he says he hasn’t faced any retribution. Iran’s leadership does seem distressed about the massive dust storms that blow in with ever-increasing frequency from neighboring Iraq, usually in the spring and summer. The dust limits visibility, causes respiratory ailments and prompts residents of some border-area cities to don gauze masks. Sometimes, the storms reach as far as Tehran, near Darvish’s snug office on the lush 360-acre state reserve, which is managed by Iran’s Research Institute of Forestry and Rangelands, Darvish’s employer. The sanctuary, technically known as a herbarium, was established in the 1960s, during the era of Iran’s pro-Washington monarchy, in collaboration with U.S. botanists. Here, female gardeners bicycle along dirt paths that wind through verdant microclimates and artificial forests. Native species coexist with exotic trees from Japan and elsewhere, many labeled with their scientific designations. Water cascades from a trio of waterfalls. Several man-made lakes mimic the marine landscape near the Caspian Sea, an area once home to the Caspian tiger, now extinct. In the evenings, Darvish returns to the city and often shares vegetarian fare with his son, Arvand, 12, who was given the Persian name of a river known in Arabic as the Shatt al Arab, which forms part of the marshy southern border between Iran and Iraq. The waterway’s environs were killing fields during the Iran-Iraq war of the 1980s. Although his country is in turmoil again, the self-styled watchdog of Iran’s natural world finds a measure of peace and tranquillity in his botanic refuge. Special correspondents Mostaghim reported from Tehran and Sandels from Beirut. Times staff writer Patrick J. McDonnell in Beirut contributed to this report. There is only need for 16921 more signatures to make UNICCO regard the bellow petition, as it is mentioned in the petition itself, as a credible global request putting the matter on its executive agenda. As a result, the international pressure on Turkey will be even more forcing its government to cease to construct their lethal dam on the Ilissos. Therefore, please sign it and send the link to your friends. Dam Project on the Tigris River. This area is unique in many ways. It hosts great geographical, climatic and biological diversity. The step of transition from nomadic pastoralism to sedentary agriculture took place here. carriers of this worldwide unique cultural heritage. town of Hasankeyf in Turkey, as well as the Mesopotamian Marshes in Iraq. existing site. Should the Ilisu Dam be built, this heritage will be lost forever. after 2003. The progress achieved is under threat now due to the construction of the Ilisu Dam. infringing upon any sites bearing the potential to become a World Heritage Site. A while ago an incident in the Abr forest region of Shahrood (a city in Semnan province) Province caused the environmentalists great despair. As a number of 150 trees were cut down by a group of local villagers, living near this marvelous forest, overnight. They stated their dissatisfaction with the resistance from the Environmental Protection Institution against construction of a road crossing through the forest as the reason behind this behavior. However, this incident was neither the first nor will it be the last of the confrontations between locals and organizations responsible for the environment and natural resources in Iran. Confrontation between rangers and some ranchers, farmers, hunters and charcoal makers are usual examples of the apparent conflict between local communities’ interests and the considerations so as to protect the nature. That only in Chaharmahal and Bakhtiari Provine, yearly one thousand hectares of Zagros forests turns into charcoal, or the constant cultivation of Zagros jungle understory despite knowing what hazard it would be to these jungles biomass capacity, the fact that the never-ending greed of the ranchers and farmers in occupying the land has been and still is being announced as the most important factor causing destruction of the northern and western natural habitats In Iran, that the refuse collection crisis and its landscape contamination is now becoming a threatening trend, obliteration of the oldest and the most valuable botanical garden being met with silence just as the dolphin slaughter in Persian Gulf and the drilling of multiple illegal wells as the existing ones are being overly used (causing soil depletion), and so on and so on … are all indications of one single sad yet true reality: that Iran’s nature, the way it deserves, does not have enough supporters, does it? The issue becomes bolder as we realize the conditions are not the same worldwide. In fact in many countries, environmentalists enjoy such value and position that would entitle them to winning the decrees to stop nuclear power plants from operation as we recently witnessed as in the cases of Germany, Spain, Italy and Switzerland. Sometime ago, when Merkel’s government announced its refusal of cooperating in construction of a dam on one of the major headwaters of Euphrates, many received it in astonishment; however, the surprise was even bigger when people realized the withdrawal was neither due to financial reasons nor to the disloyalty of the Turk party towards their commitments, but the German government being forced by the activist pressure had no other option other than to give up the project and pay the due financial compensation. The story was that the environmentalists as well as the green party in Germany had threatened Merkel’s Christian Democratic Union: that provided her government do not step back from signing the cooperation, they will shake the cornerstones of the coalition government which is what happened after “Stuttgart 21” when some of the most influential members of Merkel’s party and some cabinet ministers were, due to what was regarded as carelessness, were forced to resign. Having said that, there is one considerable difference between building a dam in Turkey and building an underground station in Stuttgart for which 300 trees were about to be cut down. The fear of losing 300 trees in a city in Germany seems logical as it directly affects the quality of Germans’ lives, but when it comes to a dam in Turkey, no such thing will happen to Germans and their country. on the contrary, at the time of economical crisis, through such source of income provided by such a profitable and lucrative cooperation, Germans could improve their economy as well as their lives. Nevertheless, the German Greens feared that in case of building the dam, desertification would accelerate in Mesopotamia, the number of dust source areas in Iraq and its neighboring countries (especially Iran) would increase and also the subsurface water level would go down. In other words, the atmosphere dominant in Germany could be defined as people’s love of nature is no longer domestic or local but it has reached a global level and these days German environmentalists not only struggle to push their government to take domestic eco-friendly measures, but are also worried about ecological stability thousands of miles away. Even further, they are ready to pay for it, why? Why are the people born and raised in Germany ready to trade their own comfort for our habitable planet stability? Why? The answer to this question, however, is not so hard, specifically after we learn it has been nearly half a century since instructive and informative ecological contents have been included in Germans’ school curriculum; in addition, scarcely does one find a newspaper or a magazine in which at least one column is not dedicated to environmental issues daily, weekly or monthly. Moreover, their broadcast media interestingly and critically analyze eco-related policies in Germany as well as the whole EU. In short, the ever-increasing people’s fondness for nature protection is the desirable result of a 50-year logical and standardized plan. Now, can “you” name one invariable weekly or monthly TV program on Iranian national TV channels analyzing the recent eco-related issues just as we observe it in other domains like sports (90) and cinema (Haft)? Can “you” even name one fixed daily page dedicated to environment in one of the mass-printed Iranian newspapers criticizing decisions and policies in this domain? It’s even more depressing when taking a look at primary and secondary school curriculum, learning how little paid attention to environment as much as we are unable to track the foot-prints of such teachings and consideration in our cinema and TV series. Now is high time we went back to our key question; is there still anybody who is still not sure “why Iranian nature, the way it deserve does not have supporters and protectors”?